When adequate time is available, match offers shall be selected to facilitate the most possible transplants except when Advanced Donation Program patients, or difficult to match pairs can be matched. Cross match has already been completed and is acceptable. Donor has already been accepted in the pre-select function. Fast track center (can go from offer to transplant in 3 business days). Second Priority: Patients at centers with the highest Center Liquidity Contribution score. Third priority: Patients with the longest wait times in the NKR system. To former NKR donors in need of a kidney transplant. To paired or ADP patients involved in real-time swap failures where the donor has donated but the patient did not get a kidney. First priority: Pairs who opted into the ADP program to repair a swap. Second priority: Longest time interval from donor donation. Paired or ADP recipients whose center reports the issue in the NKR system and provides pictures of the kidney within 8 hours of kidney receipt, will be provided a replacement kidney, if the Surgical Committee following review of the data and circumstances clearly and confidently determines the graft failure was a result of an impaired kidney that was delivered to the recipient center. Paired or ADP recipients whose center reports the issue in the NKR system after 8 hours but within 90 days of kidney receipt, may be provided a replacement kidney if the recipient surgeon presents the case and the Surgical Committee determines that the graft failure was clearly and confidently a result of an impaired kidney that was delivered to the recipient center. When a replacement kidney is provided, the Surgical Committee may choose to transfer the -1 NCS deduction from the recipient center to the donor center. To CHIPs at Member Centers with Net Chains Started (NCS) > 0 that have accepted the donor in preselects. To NKR Member Centers with NCS > 0 who have declined 2 or fewer chain end offers per chain start, in the past 12 months. To NKR Partner Centers that have the highest 'target' number which is determined by ((1.5 x ‘O’ chains started in the past 2 years) + (center's current Net Chain Started score)) (e.g. 6 ‘O’ chains started in the past 2 years + a NCS score of - 4 = a target score of 5). Photographing Damaged or Abnormal Kidneys - The NKR suggests taking digital photographs after nephrectomy and before transplant to ensure quality. Once a kidney is removed from a donor, if there are no abnormalities, digital pictures of the kidney are encouraged, but not required. If there is any damage to the kidney or any other abnormalities not already communicated to the recipient surgeon, the donor surgeon is required to email or text pictures of the kidney, packaging or box to the recipient surgeon within 30 minutes after kidney removal. If the kidney is declined by the receiving center, the receiving center must take and store pictures of the kidney that include any abnormalities. Upon receipt of the returned kidney, the donor center must take and store pictures of the kidney, packaging or box that include any abnormalities. First attempt to cancel or reschedule the swap. If any of the donor surgeries cannot be aborted, then the NKR Member Centers shall proceed with the swap and the NKR shall work to end a chain to the patient in the failed swap that did not receive a kidney. The center caring for the patient that did not get a kidney must remove all restrictive preferences and accept all viable donors via the donor pre-select function unless the center determines that it is in the patient's best interest (e.g. pre-emptive transplant) to wait longer by declining viable potential donors in order to get a better match. If the patient that did not get a kidney is hard to match (e.g. NKR cPRA > 95%), the NKR may not be able to find a compatible donor for that patient. This risk must be disclosed in the Member Center's informed consent documentation that is signed by the patient and the donor. In the calculation of "net chains started", the donor center is accountable for the chain break. The donor center shall cover all costs related to the donor surgery and donor care. The kidney will be immediately shipped back to the donor center for transplant into a wait-listed patient. The recipient surgeon may be required to review the case with the Surgical Committee. The donor surgeon may be required to review the case with the Surgical Committee. If there is ambiguity regarding the adequate function of the declined kidney, the Surgical Committee will make a determination based on medical data provided to the committee by the transplant centers involved in the real-time swap failure. Advanced Donation Program - The Advanced Donation Program (ADP) is a paired exchange separated in time. This program allows medically and psychosocially acceptable donors to donate their kidney before their Intended Recipient receives a kidney at the end of a chain. Your center must be approved by NKR to participate in the Advanced Donation Program. An ADP donor that starts a chain does not increase a Member Center’s Net Chains Started score. There is no guarantee that the patient(s) can be matched or transplanted. ADP forms must be uploaded to the NKR website prior to activation. ADP pairs are subject to the review of the NKR prior to the advanced donor’s donation. An ADP Recipient may have up to five ADP Donors. The ADP donor and Intended Recipient can be at different centers, but those centers must both be ADP participating centers. Member Center Suspension - The NKR reserves the right to suspend Member Centers from inclusion in match runs if the Member Center is deemed to have introduced safety risks or is in violation of Member Center Requirements. Suspension shall continue until appropriate corrective action plans have been submitted to, and approved by, the Medical Board. Should the Member Center wish to present the corrective action plan to the Medical Board, a conference call with the Medical Board will be scheduled. Surgical Review - If the Recipient center requests an investigation then the NKR Surgical Committee will review the case in detail. Member Centers shall not have forecasted net chains started less than 0. Member Center's 30 Day Moving Average Preselect % is at or above 95%. Member Center's Data Compliance is at or above 99% with no more than ten total items outstanding. Member Centers do not reverse pre-selects after a match is offered. Member Centers shall have surgical availability to accommodate Tuesday, Wednesday, or Thursday surgery dates with three weeks advance notice. Due to the high volume of NKR activity, one surgical date decline per month will be waived for Partner Center's. Member Centers shall not cause avoidable swap failures or safety issues. Member Centers must report cryo XM results by 15:00 ET on the fourth business day from the day the cryo cells are received. (e.g. If the cryo cells arrive on Tuesday, the results must be recorded in the NKR no later than 15:00 ET Friday). Member Centers must respond to all requests for donor review within 2 business days. Member Centers must upload Serology results to the NKR site at least 6 calendar days prior to the donor’s target surgery date - this excludes internal non-ADP chain end positions and positions that were offered 14 days or less before surgery date. E.g. if a donor surgery is scheduled for a Tuesday, the serology results must be uploaded no later than Wednesday of the prior week. All Routine Member Center Requirements are assessed at month end. Centers shall share all relevant information to ensure the best possible outcomes for all swap participants. Centers shall act with the utmost spirit of cooperation to achieve the greatest number of successful transplants across all member centers. Centers shall ensure all information entered into the NKR web site is updated and accurate. Centers shall have cryo preserved cells on hand for all paired donors. Member Centers must accept cryo samples for Exploratory & Screening XMs. Centers shall have CT scans and donor charts uploaded to the NKR system for all paired donors. Centers shall ensure swap participants are ready to go to surgery once they are activated in the NKR system. If a pair becomes unavailable to participate in a swap (e.g. recipient sick), that pair must be immediately deactivated in the NKR system. If a donor is travelling internationally or expects to be unavailable for blood draws for a period of a week or more, they must be deactivated in the NKR system until they are once again available for a blood draw. Centers shall enter accurate post-transplant data so that research can be conducted on patient outcomes. Centers shall not contact another center's donor, recipient or lab for any purpose. Centers shall immediately request an exploratory cross match if there is a reasonable chance of an unacceptable cross match with a potential donor. Centers shall provide the NKR, upon request, a root cause and corrective action plan within one business day of the request. Centers shall, prior to a swap kickoff, run back-up lists for both sides of the swap in the event that a donor kidney removed at your center cannot be shipped and must be used at your center or your center receives a kidney and your recipient is unable to go to surgery. Centers must complete the NKR organ packaging checklist and ensure a copy of the organ packaging checklist is shipped with the organ in order to comply with CMS regulations. Centers involved in swaps shall have proper kidney packaging supplies on hand and a trained organ preservationist on call to pack the kidney in case the kidney is shipped back to the donor center. Centers shall request information using the "REQUEST DONOR INFO" feature. The Donor Center must enter the requested information into the donor profile and notify the requesting center that the requested information has been added to the donor profile within 1 business day of receipt of the request. Donor center must register the donor and obtain a UNOS Donor ID number. Centers shall have laparoscopic donor surgical capability. Centers shall communicate to all donors that the expected turn-around time for a blood draw request is one business day. Centers should perform a wellness check on both the donor and recipient within 24 hours of scheduled surgery. The minimal requirement for the wellness check is a phone call to the donor and recipient confirming they are healthy and ready to move forward with the scheduled surgery. Centers are encouraged to place recipients on hold for deceased donor transplants, once cross matching commences. Recipient Centers shall email a case report within 48 hours to NKR and the donor center when a swap kidney is NOT transplanted into the intended recipient such as when a kidney is discarded, when a kidney is transplanted into a patient other than the intended recipient, etc. The case report shall include all information needed to satisfy the donor center's regulatory reporting requirements. When arranging a loop swap (no NDD or BD), all donor surgeries shall be scheduled on the same day and if a red-eye flight is used in the loop, the patient receiving the kidney from the red-eye flight will be scheduled for surgery the day following the donor surgeries. Member Center's Earliest Organ Pickup Time is 10:00 or earlier. Member Center's Latest Organ Delivery Time is 18:00 or later. Monitor the GPS beacon for incoming shipped kidneys as outlined in the GPS Tracking section. If an Exchange Coordinator becomes aware of a situation that puts the swap at risk he/she must immediately send an email to Member Services with notification of the situation and then contact the NKR Swap Manager via phone. If the Swap Manager cannot be reached via phone the Exchange Coordinator must alert their NKR Center Liaison or any other member of the NKR staff. If a center experiences an issue that is reported in the quarterly swap failure report, the primary or backup coordinators must attend the National Coordinator call to review the root cause and corrective action related to the swap failure. Donor and recipient surgeons at a Member Center shall proactively organize their schedules to ensure surgical capacity is available for KPD procedures on Tuesdays, Wednesdays, and Thursdays with 3 weeks advance notice. The donor surgeon must call the recipient surgeon within an hour after completion of the donor nephrectomy. If the donor surgery went well and there are no concerns, and the recipient surgeon is not available, a voice mail will suffice. If there are concerns, a second attempt should be made to reach the recipient surgeon. If the second attempt fails, then the recipient center coordinator must be contacted to pass along the information. The surgeons must speak when both are available. Center contacts both donor and recipient to ensure pair is ready for surgery. Center reviews the virtual cross match & CT scan on NKR site. Centers shall respond to match offers by the match offer deadline which is generally within one business day of the offer. When a match offer is accepted, the pair must be immediately deactivated in all other exchange programs, including internal programs. When a match offer is accepted, the recipient's chart must be reviewed for updates and creatinine must be immediately rechecked for predialysis patients. Centers are encouraged to deactivate patients in the deceased donor system immediately following the logistics calls for NKR swaps. Any known potential swap risk must be communicated to NKR immediately via email and reiterated on the logistics and kickoff calls. Centers shall accurately enter all donor and recipient antigens, and all recipient avoids including low level DSA's. The NKR provides confirmatory ABO typing for all donors, we also include subtype for A, and AB donors. If a discrepant ABO or subtype is reported between the center and NKR then it is the responsibility of the donor center to retest the donor and notify NKR of the results. For any donor listed as an unknown subtype the NKR will determine the subtype and update the donor profile. The NKR provides confirmatory HLA typing, including enhanced resolution typing. When new pairs are first made exportable, the antibody screenings used to determine the avoids shall be current (within 30 days). Centers shall conduct antibody screenings every 90 days for sensitized patients and update the avoids appropriately. Donor blood for serology tests must be shipped to the NKR lab no later than 9 days before surgery and the test results uploaded to the NKR site no later than 7 days prior to the donor's target surgery date to insure the donor can proceed. Member Centers must have the ability, through their own or NKR lab, to provide serology test results in three calendar days or less. If a center reports an unacceptable cross match, the lab director shall review the root cause and corrective action plan on the National Lab Director call. 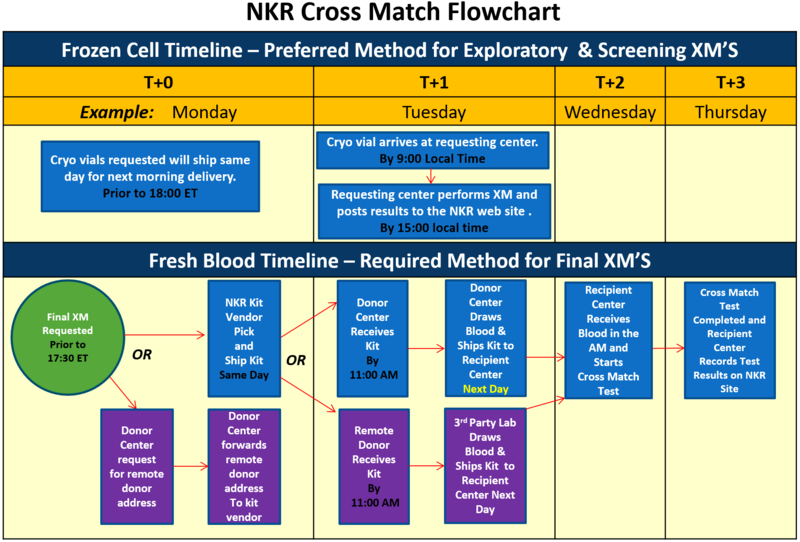 Exploratory cross matches are requested by a recipient center prior to a match offer to confirm a donor is compatible with a sensitized recipient. Screening cross matches are required once all match offers in a swap are accepted; this cross match will be commenced by NKR. Final cross matches are requested by the recipient center 1-2 weeks prior to surgery (cryo preserved samples cannot be used for Final cross matches). Donor center draws and ships donor blood to the recipient center/lab. Donor blood tubes are labeled according to the instructions. Recipient center receives the blood, performs the cross match and records the results on the NKR web site. Donor center ships cryo preserved NUCS to the recipient center/lab. Cryo preserved NUCS are labeled according to the instructions. Recipient center receives the NUCS, performs the cross match and records the results on the NKR web site. When using cryo for a screening crossmatch additional NUCS may be requested, if needed, to perform additional tests. To reduce the inherent shipping risks related to connecting commercial flights, an on board courier must be utilized for all connecting flights. Red biohazard bag inside organ box. Clear plastic bag with ice inside a Styrofoam container. Triple barrier packaged kidney (one of which is jar) - all sterile. Labeling attached to kidney bag. A UNOS label filled out according to UNOS standards on the outside of the box. NKR supplied GPS Device, unless the kidney is travelling via On Board Courier. NKR supplied Human Organ stickers affixed to all 6 sides of the box before other labels are applied so that other labels are fully visible, NKR Stickers will be supplied in the GPS box. Destination mailing address on the outside of the box (recipient center). Return address on the outside of the box (donor center). Two ABO verifications for the donor. Kidney anatomy (aka Renal Data Sheet). Teidi Donor Registration Page: Please 'print screen' this page (page displays Donor Name, DOB, Donor UNOS ID Number). Donor blood tubes per recipient center request packaged so that they do not come in contact with the ice. Copy of the completed NKR packaging checklist. Kidney must be 100% covered in ice. If the packaging provider does not provide the packaging services adequately then they will not be paid for the inadequate packaging service. Inadequate service includes, but is not limited to, not responding to a RCCAP request within 2 business days. It is the responsibility of the recipient center coordinator to monitor the GPS device. Donor Centers will receive a GPS device, from NKR approximately 1-5 business days before donor surgery. The device requires no activation. The GPS device must be packed on top of the ice or inserted between the shipping containers, unless an On Board Courier is transporting the kidney. The GPS device should be given to the driver, not packed in the box with the kidney. A letter should be given to the courier explaining what is in the box, as well as instructions not to open the box. Click here for a sample letter. Coordinators at both the donor and recipient centers will receive periodic alerts to their cell phone and Email, giving the location of the GPS beacon. Once airborne at an altitude of approximately 5,000 feet and higher, the Last Known Location will no longer update. The coordinator must contact the swap manager immediately if there are any inconsistencies between the GPS readings and logistics plan. Recipient Centers will receive pre-paid return packaging from NKR for the return of the GPS. The GPS device must be sent back to NKR within one business day of recipient surgery. In addition to periodic alerts the device can be tracked via the internet, instructions on accessing the GPS tracking website are listed below. Contact your NKR liaison to acquire user name and password. Click here to the NKR tracking software. Enter the username and password you were given and click Sigh In. On the top of the screen click on the "Mapping" button. On the bottom of the screen click on "Scenario" then click the scenario that you would like to view the location of. Click on the icon that displays the current location to view a breadcrumb trail of the scenario. Living Donor Evaluation- The purpose of the evaluation and consent of the living donor is to maintain the highest degree of safety and transparency for the living donor. As a baseline, the Amsterdam Guidelines and the OPTN standards will be used for donor evaluations. Donor evaluations must be completed before a donor can be activated in the NKR. The donor center evaluation policies should be followed by the donor center and not be directed by the recipient center since the donor center is responsible for donor care. The receiving center may ask for additional testing to clarify issues related to the quality of the kidney or to ensure there is minimal risk of infectious disease transmission. Requests for additional donor testing should be made immediately upon cross commencement in order to avoid late stage donor declines and failed swaps. As of 11/1/17 the NKR began purchasing donation insurance for all donors who donate a kidney through NKR. BP at two different settings on different days. Age appropriate evaluation for cancer. Donor work-ups must be repeated in their entirety, every 12 months, except for CT angio, unless the first CT angio was abnormal. 24 hour urine for albumin excretion and creatinine clearance. Anatomic Testing for anatomy definition. If a donor GFR reading comes in at or below 85, the center will perform a nuclear medical GFR test to confirm the donor's GFR is > 80. If there is > 10% difference in donor kidney size (between the two kidneys) then the smaller kidney will be offered for donation. Spot Urine albumin: creatinine ratio measurements may be used instead of 24h proteinuria at centers that use nuclear medicine GFR measurement. The acceptable range for urine albumin: creatinine ratio is less than 30 mg/Gm. Birth or residence in a TB endemic country. Close contacts of individuals with TB (Household or family members). Donors who work or have resided in homeless shelters, correctional facilities, nursing homes, or hospitals. History of IV drug use. Evidence of granulomas or healed TB on CXR. For donors meeting the criteria for high risk we recommend Interferon-gamma release assays (IGRAs) or tuberculin skin test (TST). Recipient center may choose to have additional testing performed at time of match offer acceptance. No hypercalcuria, hyperuricemia, or metabolic acidosis. The donor meets the criteria shown previously for single stone formers. The current stone is less than 1.5 cm in size, or potentially removable during the transplant. Nephrocalcinosis on x ray or bilateral stone disease. Stone types with high recurrence rates, and are difficult to prevent. The UNOS required 6 month, 1 year, 2 year follow-up should not be included in the organ acquisition cost center or separately billed to Medicare. Follow-up care rendered by a physician who performed the operation is included in 90 day global. After 90 days, charges are billable to recipient's Medicare number. For follow-up care rendered by physician other than operating physician, bill to recipient's insurance for up to 3 months unless directly related to complications of the donation. Charges are routed to Organ Acquisition for up to 90 days or up to 6 months if potentially related to complications. After these time periods, facility charges may not be allowable on the Medicare Cost Report. In all of these situations, the donor is not responsible for co-insurance or deductible. NDD's should be made aware of their donation options. They can either start a chain of transplants or donate to a single recipient on the centers waitlist. If an NDD donates to someone on the center's wait list, the scheduling of the surgery may be easier for the NDD. If an NDD starts a chain of transplants, they will generally help more people get transplants. It often requires a long wait time for "A" and "AB" blood type NDD's to start a chain of transplants. It is the responsibility of the Center to educate the NDD. Centers should fully explain the donation process to the donor and should let them know what to expect, before, during and after surgery. Centers should ensure that the NDD can get appropriate time off from work. Centers should determine the NDD's availability for surgery and accurately enter it into the NKR system. Centers should ensure the NDD is updated on a timely basis regarding where they are in the workup process, results of all medical tests, when they are activated in the NKR program and the status of chains that the NDD is facilitating. The Center should inform the NDD that there may be financial support available to assist them in the donation process if they qualify. Eligibility guidelines can be found by clicking on the link to the National Living Donor Assistance Center website. Bridge donors should be prepared to donate between one week and three months of their paired recipient's surgery with no significant schedule limitations. Bridge donors must have no significant medical risks that could prohibit them from donating. The donor center must be confident that the bridge donor will follow through with donation. New centers may want to complete at least three exchange transplants prior to identifying donors as bridge donor candidates. Discussions regarding the possibility of being a bridge donor should begin at initial donor evaluation and continue throughout the process. If there is any hesitation with the potential bridge donor, the center should decline offers to bridge the donor and identify the donor accordingly in the NKR donor profile. When asking a donor to bridge, an in-person discussion should occur and include the donor's support person. Member centers must maintain frequent contact with bridge donors. Member centers should advise bridge donor candidates to discuss their commitment to paired exchange with their employer early in the process and again when they become a bridge donor. Member centers must clarify any time constraints with bridge donor candidates and advise donors of the need for immediate notification of any unexpected travel plans and availability during that time for blood draws. Member centers should re-educate donors and reconfirm their availability prior to accepting the donor for a bridge position in a swap. If a member center executes the donor protection Addendum they agree to pay for all Uncovered Complications (Donor Complications that are not reimbursable by the recipient insurance, recipient center or recipient) for all donors that undergo donor surgery at the Member Center’ Hospital. If a Member Center does not execute the Donor Protection Addendum, they will be billed for donor protection according to the Standard Reimbursements Section to accumulate a fund for uncovered donor complications. The fund is intended to protect donors at centers that have not signed the donor protection addendum. The donor protection fund will be capped at $1 million. Donor claims in excess of the amount in the fund will not be covered. If a Member Center records Medicare as a patients primary or secondary insurance and the patient does not complete their Medicare enrollment before the transplant or at the time of transplant, the recipient center shall pay for all Uncovered Complications for the donor who gave a kidney to the patient with the inaccurate Medicare designation. Donor Follow Up - Shall be the responsibility of the center that performs the donor nephrectomy. Participate in the Advanced Donation Program (ADP). Have signed the ‘All-In’ addendum. Have agreed to accept all chain end match offers. Use any and all good faith best efforts to coordinate and provide kidneys to ADP recipients, in the event the NKR becomes insolvent and/or ceases operations, beyond the termination of this contract. For information on becoming a Donor Shield Center contact your NKR Liaison. If the patient is on dialysis and has the requisite work history, then Medicare enrollment is granted based on dialysis prior to transplant. If the patient is not on dialysis and has the requisite work history, then the center should assist the patient with the process for Medicare enrollment at the time of transplant and communicate a billing hold to current payor(s) until Medicare is effective. Additionally, the donor center must agree to hold billing for all professional fees until recipient's Medicare policy goes into effect (a billing hold is better than billing and reimbursing the current payer and then rebilling Medicare). Centers must assist patients with obtaining documentation of Medicare entitlement so that the center can complete a CMS Form 2728 Medical Evidence Report (MER) in order to implement Medicare coverage. The recipient's Center must provide a completed CMS 2728 Form to the donor center upon match offer acceptance. Medicare entitlement should always be confirmed prior to transplantation so that the patient is aware of any potential out of pocket expenses, the need to choose RX coverage and other related financial issues. When entering patient avoids, include all low-level Donor Specific Antibodies (DSAs). By entering all DSAs, the patient will have a more accurate cPRA, increasing their matching priority in the NKR. By entering all DSAs, you will increase the odds that NKR will find a better matching donor for your patient. By entering all DSAs, you will reduce the risk of a swap failure caused by unexpected unacceptable XMs. If you patient has an NKR cPRA > 95% (hard to match), use the “Avoid Conflict” tab in the preselect screen to find additional matching donors. Review all potential donors with one or more avoid conflicts in the Avoid Conflict tab. Override avoid conflicts by accepting donors with low level DSA’s that, in combination with other DSAs, will not cause an unacceptable XM. Request cryo cells and perform rapid exploratory XMs on those borderline donors where the XM results are not predictable. Center Liquidity Contribution (CLC): Centers that enter “O” NDDs and ABO favorable pairs (“O” donors with “A”, “B”, or “AB” recipients) will receive CLC points which will prioritize the patients at that center. A positive CLC score has the greatest impact on shortening wait times for pairs with unfavorable blood type combinations (“O” recipients with “A”, “B”, or “AB” donors). Multiple Paired Donors: Many centers have unfavorable blood type combination that wait a long time for a match offer. If your patient has another donor, you can increase their odds of receiving a match offer by entering the second donor into NKR but the most powerful way to get these patients transplanted is for the center to achieve a positive CLC score. One criterion that is used to prioritize potential matches is wait time. Wait time is accrued for days that the pair is "exportable" and is NOT based on registration date. The sooner a center can make a pair exportable and the longer the pair remains exportable, the more wait time the pair will accrue. Abundant A2 donors: If you have an “O” recipient with titers acceptable for an A2 donor, you can generally get an immediate match if you set the patient filed to allow for A2 donor matches. Many donors are declined on anatomy, blocking potential matches. In some cases, these declines can be overcome by offering the other kidney which may not exhibit complex anatomy. This can be accomplished by selecting the appropriated options in the donor record. Compatible pairs: An A, B or AB patient with a compatible O donor will find a match immediately and can afford to be very selective when accepting potential donors while other compatible pair blood type combinations (e.g. O to O, A to A, etc.) may not be matched as quickly and therefor may have longer KPD wait times. Centers should consider using charter flights to ship kidneys when no direct flights are available. An analysis of transport options showed that for a nominal 18% average increase in costs for a charter compared to an on-board courier, transit times are reduced from an average of 11 hours to less than 5 hours. If you have a patient that has not received a match offer and you are wondering if there is an issue with the paired donor, that is causing centers to decline the donor, look at the declines tab in the donor profile. This tab provides an accounting of the donor declines and the reasons for each decline. Coordinating surgeon vacation/travel schedules to ensure coverage on NKR target swap days which are Tuesday, Wednesday & Thursday. Cross training donor and recipient surgeons so that one surgeon can do both surgeries. If your patient has an NKR cPRA of 99% or less and all DSAs have been listed as avoids so that the cPRA is accurate, this patient should not require desensitization and should be matched/transplanted in 6-12 months. If your patient has an NKR cPRA of 100%, they will likely require desensitization to get matched/transplanted in the NKR. If your patient has an NKR cPRA of 99% - 100% and they have been waiting more than a year for an NKR match, they may require desensitization to get matched/transplanted in the NKR. Failed crossmatches can be devastating for NKR chains because one failure often affects many potential transplants. On average, a single unexpected crossmatch failure in NKR impacts 8 surgeries. Crossmatch failures are also costly when tests at other centers are performed for patients who cannot proceed to transplant. Although some crossmatch failures are unavoidable, most can be prevented by the HLA laboratory by playing a proactive role in donor selection. 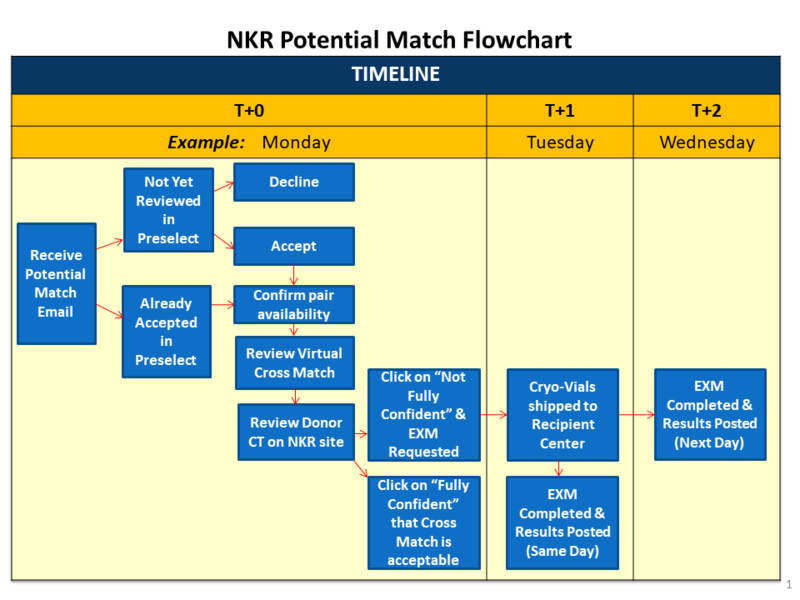 The NKR has developed tools to preview potential donor matches and perform exploratory crossmatches on potential donors for sensitized patients. Using these tools will improve your patients’ chances for transplant and will reduce unexpected crossmatch failures. Good communication and understanding between the laboratory, coordinators, physicians and surgeons is a key to success in paired exchanges. Convey the importance of avoiding or at least reporting potential sensitizing events to the transplant team and to the laboratory. Patients should notify the transplant team prior to being transfused, having surgery, etc. Retest patients whose antibody profiles may have changed. Review patients with special requirements for compatibility (e.g. children, patients unable or unwilling to accept a donor with potential incompatibilities). Establish clear crossmatch thresholds with your transplant team. Borderline positive or negative results may change with retesting. Flow cytometry results are semi-quantitative, rather than a dichotomous positive or negative, flow values provide an indication of increasing risk. Screen for IgM or autoantibodies. Treat patient sera with DTT or EDTA to reduce prozone effects in solid-phase tests. Test sera at dilution to identify weak antibodies or antibodies at saturation. Be careful enrolling patients in KPD with non-HLA antibodies that may preclude a transplant. List more low level avoids for easy-to-match pairs (cPRAs < 95%) since they will have many potential donors. List more low-level avoids for patients who will not tolerate aggressive immunosuppression, plasmapheresis or who otherwise require a completely DSA-free transplant. Review donors with one avoid HLA antigen in the avoid conflict tab. Determine whether desensitization is feasible for specific incompatibilities. Review ABOi donors for 100% CPRA patients (ABOi is often less difficult than desensitization for HLA). Contact the donor center laboratory to ask for donor typing details in needed. Use tools like NMDP’s website (http://www.haplostats.org/haplostats?execution=e1s1) to predict allele types based on high resolution haplotype frequencies. Use tools like the epitope registry (http://www.epregistry.com.br) to evaluate allele reactivities in the context of shared potential epitopes. Cw, DQ or DP DSAs with uncertain crossmatch potential. Allele-specific antibodies not likely to react with a selected donor. Exploratory XMs should be requested as soon as the potential donor becomes available via preselect. Exploratory XMs using NKR supplied cryo cells should be completed in 1-day.